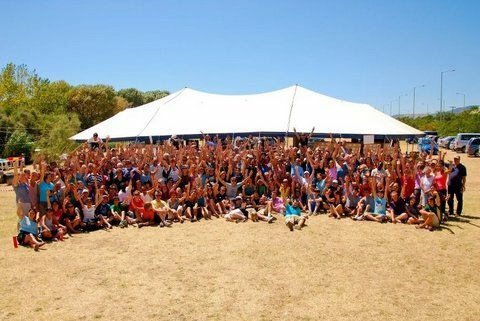 All 323 volunteers from around the world! DATELINE: NORTHERN GREECE—These are turbulent financial times for the Greek people, but a group of 323 volunteers from 22 countries around the world (including 14 members of a Wheaton Bible Church GO Team), have spent the past seven days bringing good news to the people of northern Greece. Together they have distributed 126,207 Bibles in modern Greek. In addition, each New Testament included an audio MP3 version of the Greek NT and a challenging personal testimony from a Thessalonian Greek who came to Christ after overcoming his addiction to gambling. The volunteers covered a distance of 67,947 km and visited a total of 519 villages in Northern Greece. This may well prove to be the biggest evangelistic effort in Greece’s history. WBC missionary, Johnathan Macris, who is president of Hellenic Ministries, was elated at the opportunity of reaching so many people who would not ordinarily come into contact with the Gospel. His support was particularly meaningful because the Greek Orthodox Holy Synod had previously condemned the project and the Hellenic Ministries organization as ‘deceitful and heretical’ and had warned its faithful followers to steer clear of their activities. As the week wore on, public awareness and curiosity intensified, including newspaper coverage, radio and TV interviews—even reaching across the border into Turkey, where awareness of the Bible distribution was significant. “This sort of interest and positive coverage of an evangelical event are unprecedented in Greece,” Johnathan said. “You can’t help but wonder if God is doing something unique and momentous. Perhaps echoing the words of the prophet Isaiah, ‘I am about to do something new. See, I have already begun! Do you not see it? I will make a pathway through the wilderness. I will create rivers in the dry wasteland’” (Isaiah 43:19, NLT). EURO 2012 Soccer Championship: Over 30,000 New Testaments distributed! WBC Missionary to Ukraine Wally Kulakoff says he was “awestruck by the once-in-a-lifetime opportunity” to distribute New Testaments and share the Gospel during the Euro 2012 soccer championship. This massive sporting event brought a flood of athletes and fans to Kiev, capital of Ukraine, during the month of June and early July, setting the stage for Ukrainian believers to go into the streets, parks, and shopping centers where they could sit beside people, share the Gospel message, and give interested people the Word of God. “Many responded,” Wally reports, with an average of 1,000 New Testaments being handed out each day and an average of 20 people a day coming to faith in Christ. Let’s join him in praying for the tens of thousands of Ukrainians and others from across Europe who now have their own copy of the New Testament—that many will find their way to local churches where their faith will grow and transform their lives. This entry was posted on September 8, 2012 by Wheaton Bible Church in Fall 2012, Missionaries and tagged GO team, Greece, Hellenic Ministries, Johnathan Macris, Kiev, missions, Short-term missions trip, Soccer, Ukraine, Wally Kulakoff.